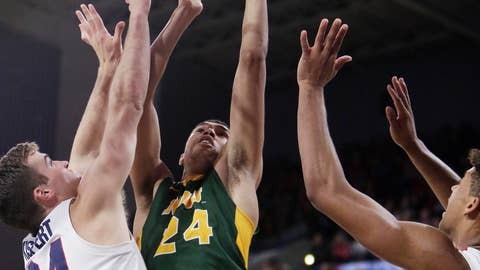 SPOKANE, Wash. (AP) — North Dakota State didn’t figure to pose too much trouble for Gonzaga on the day the Bulldogs rose to No. 1 in The Associated Press Top 25. The Bison didn’t. “Mission accomplished,” Gonzaga coach Mark Few said. Few had worried about his team having a letdown after beating former No. 1 Duke at the Maui Invitational, in part because of the long trip home. But that didn’t happen. Gonzaga replied with a 19-0 run, making seven consecutive field goals, for a 37-19 lead. Clarke had 10 points and Josh Perkins had a pair of 3-pointers in the run. The Bison were scoreless for more than 6 minutes before Cameron Hunter’s 3-pointer ended the Gonzaga run.